Using different tools, drag and drop items out of their sockets. Buy replacement parts and put everything back. You need to get a 5 star rating to win. New video up and download link is ready. Not much of a game right now, but its in a place to get feedback so we can work on it for the last day of the jam. I really like the the extensive layering of it all, sounds like it could make structures that emerge very much in line with theme! This looks so pretty. Whats there has insane polish. Exited to see the 72hr version. Might be a few mins after submission but within the grace period. Great looking character. Love the artstyle. This looks super duper dope!! Stunning Visuals (0o0) Any feedback I give will be way too late for this Jam but I really hope you keep working on this afterwards and turn it into a full game! Your audio is super juicy too! Yay! Final submission is up! Good job on this! The only thing I didn't enjoy was that it was over too soon. I want more! The art is amazing, sounds are juicy. Overall experience is quite polished, nice visual feedback on the UI as well. The visuals were playful. The soundFX suited the game nicely. I thought it was weird that I could only handle/move the screws around the screen if I used the screwdriver. And if I bought a new screw, and dropped it on the screen without using it immediately, it would be forever lost to an unusable state - Minor glitches and preferences. I'm guessing a large chunk of your time was spent on the visuals. I would have liked more complexity in the tinkering system, but I understand that time was limited. The principle is really cool though. I would love to see iteration on the mechanic since it doesn't feel like it it has sunken its teeth into the theme just yet. I'm guessing a large chunk of your time was spent on the visuals. I would have liked more complexity in the tinkering system, but I understand that time was limited. The principle is really cool though. I would love to see iteration on the mechanic since it doesn't feel like it has sunken its teeth into the theme just yet. Yeah, i noticed the day after that there was a bug with dropping a screw to close to a hotspot it would click the hotspot, not the screw. Do you think the screw should be handled with fingers when they are in the dropped state? also when buying a new item, it works with the same drag mechanic so if you dap it then it just drops it. suppose I should work that differently. Most my dev time went it into a generic tool/component tinkering system that could handle any number of tools/component but could still remain quite generic and extendable, which I suppose isn't great for a game jam :P but moving forward id say I could keep most of the code. You are absolutely right at the moment its a very thin mechanic. We would love any feed back on taking it forward as we want to have it in playtopia. I'm thinking somewhere between Papers, please and VA-11 Hall-A. One small request the canvas doesn't scale well as I was unable to see the two uppermost and lowermost icons on the right. The starring system is an interesting addition. Would be cool if the client came in with a budget and you had to balance making a profit and impressing them. Then that rating gets added to an average overall rating which determines how many people you see every round. At least that's where I think you were going with it. Thats a pretty good idea there! so maybe instead of buying a new part you can repair it yourself, maybe in some sort of minigame? if you repair it successfully and within a good time you get a better rating or cash or something. Maybe you could also rip off customers, take a hit on the rating but save some cash and buy a new tool or something for a bigger job? very sick visuals !!!! great work team! AHHHH THIS IS SOO COOOOL. I loove the atmosphere, and the fact that items are priced in rands (I assume) is a cool touch. I felt this implicit African context playing it, imagining it was in some dodgy alley off long street or something. Not sure if it was intentional but it's amazing what a single "R" can do. I played it a few times but found no way to swindle the customer :( although I did sell all her gear and then quit, so maybe that counts. Wish you guys got around to adding dialog, the world here feels like it could be so cool. This game was very fun to play - very polished as well. The visuals were stunning - I can see how this could evolve into a much more dense game. The music really sets the tone - nice job @ palmdrive ! Enjoyed the look and feel of the game, though the video on the itch site spoiled it a little as it gave away the solution. Think going in blind would've made for a more effective toybox. I played the android version, and I encountered a bug in which I couldn't move the screws after moving them once. I had to restart to complete the game. 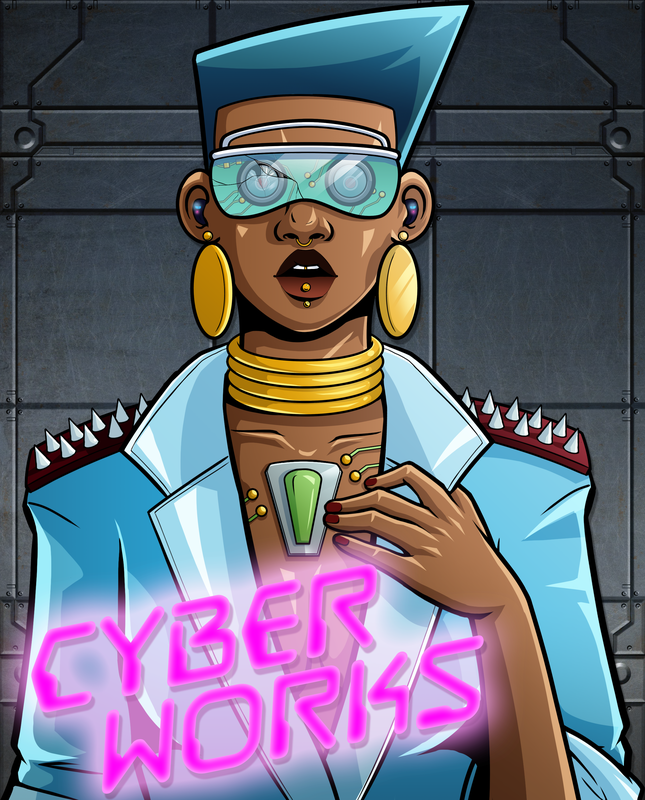 Okay, I'm super biased because cyberpunk is right up my alley. It's kind of strange how bright and colourful the art is, and how the music is fairly up-beat, when what you're doing is fiddling with someone on an operating table and (I assume) kind of figuring it out as you go along. :P It's an interesting effect to me, as it's so deliciously dark without pushing the tone overboard into something that would feel problematic or torturous. I never really figured out what the difference was between the "Nuclear Waste" box and the "TV screen" was in terms of dragging things over them. I couldn't see why I'd want to dispose of something if I could sell it instead. At 4k and 1920x1080 resolution the background image doesn't cover the whole screen, leaving large default-Unity gaps. I assume this was meant to be played portrait on mobile or something. I wish this was longer, with more patients or more solutions. I also would've liked to see more valuable feedback left on other games. But this was great, and I'd love to play something like this again. Congrats!